Things we have found that do not work well - lighting candles on a windy hill! The Druids obviously used magic but we have found that in all but the calmest of conditions lighting candles in a group setting is troublesome..... even with candles in jars. 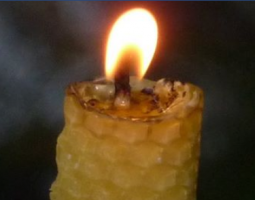 “May the fire of Brigit light your way... May the fire of Brigit warm your heart... May the light of Brigit inspire your mind"
Sheets of beeswax, which can be easily rolled into a candle, are available to buy online. You can also obtain pre-waxed candle wicks, treated to burn easily. They are ideal as a craft for a ceremony if you want each participant to invoke their own intentions. As we evolve and flow with life's changes we are often working with transitions in ceremony and meditation. Eileen decorated this candle with a labyrinth symbol in January 2013 when the Meditations moved venue from Ardbraccan to Hill of Tara. We lit it at the beginning of our last night at Ardbraccan then intentionally extinguished the light at the end of the evening. When we met again at Tara we re-lit the candle and let it burn during the evening meeting. The intentions expressed were that, whilst we acknowledged the changes, we also wanted to maintain a continuity of general goals and aims for the event.